Here at Crafters Cupboard we have been running a series of monthly Art Journaling workshops over the last six months. A keen bunch the group has proven to be, producing some great work both in the classroom and later at home as part of the 'homework' challenges ! At our April workshop I took the opportunity to prowl around with my camera and capture just a few of the pages to share with you all. Apologies to the artists (who all gave me permission to click away) for not name dropping, but the reason for this blog post is more about given our readers a glimpse of some of the fun that we have had during this workshop series. A very busy bunch of bees working away. The theme of this workshop was 'Texturise That' and they sure did do a lot of texture on what turned out to be awesome journal pages. As you can see, lots of texture going on the pages ! The final shot is from a journal page completed by Naomi Whittaker which I think sums up the fun everyone is having with art journaling …. 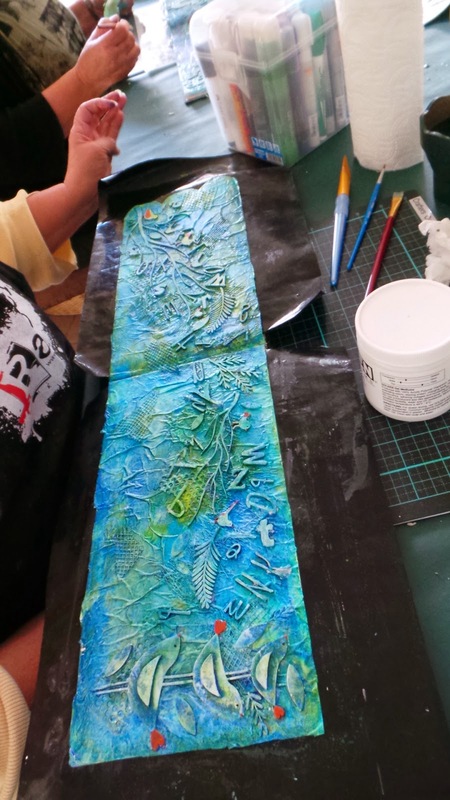 as a new class/workshop programme that we have been working on is now shaping up, and class information & booking will be available on the web in the coming weeks, including more art journaling and mixed media. We are also now getting in our art product lines, starting with the Caran D'Ache Neocolor II crayons which are now on the website !